For those who do not know, our family celebrated the cutest (I know I'm biased, but seriously she is the cutest) little girl in October. And it was even more exciting because we had had three boys first. So she is definitely a dream come true! Because she is potentially our only chica, I have been going a little crazy on the girly stuff. I have gotten really good at making baby bracelets and flower clips. And I love dressing her in frills and pink. I hope I'm not making any of you gag. So here's a little cuteness I whipped up for her Valentines day putfit! Cut the tule into 1/2 in. squares. Thread your needle and make sure to start from inside the onsie so your know does not show. As you begin fold the tule square into fourths and thread the needle through the corner with no openings. Each time you thread through the onsie attach one square of tule in a heart shape. Cut the fabric into two strips. The headband should measure 4 in X 10 in. The tie or smaller piece should measure 2 in X 4 in. Fold the two pieces of fabric in half long ways inside out. Iron to get rid of wrinkles. Sew a seam up the open side on both pieces. Turn the pieces right side out. By doing this you should not see the seam. Fold in the ends of both pieces of fabric. Fold the headband onto itself and wrap the smaller tie piece around the headband. 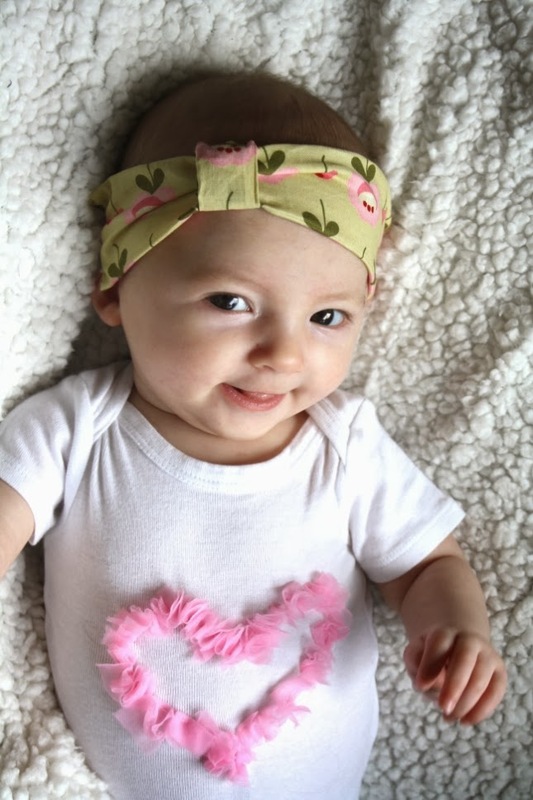 You will want the folded side of the headband to appear on the front so there is a cute crease. 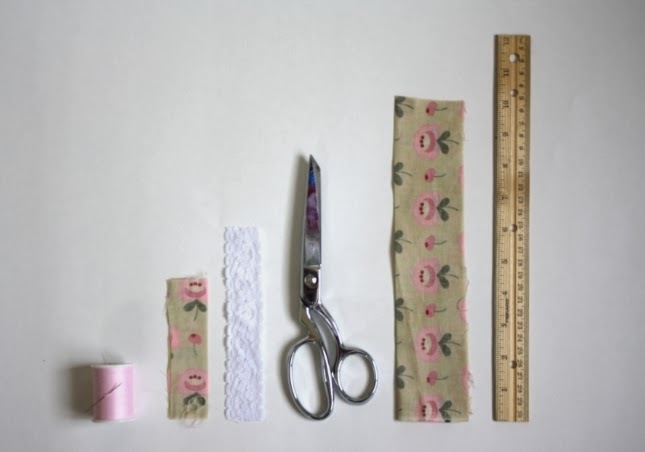 Sew the smaller tie piece together in the back to hide the seam. 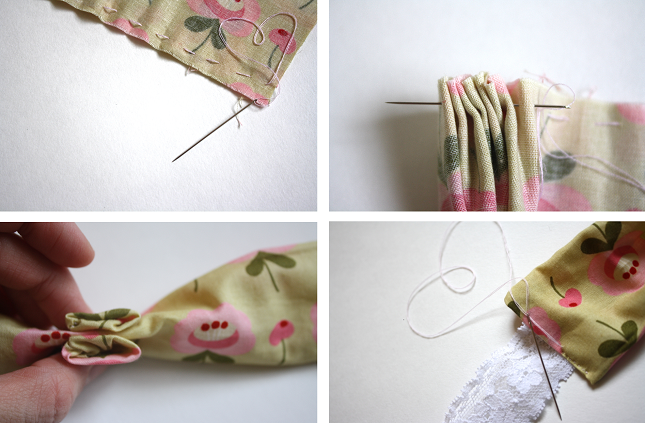 Slide the elastic piece into the folded ends of the headband at least 1/2 in. As you sew make sure to catch the elastic piece tightly. Repeat for the other side connecting the elastic piece. Thanks for letting me share my newest addition and crafting adventures. Have a joyful day! I love your hearts in the thread :) Too cute. Thanks Lisa! You're too sweet! It was so fun to make and shoot. I bet your little one would look adorable! SO cute! (the headband and onesie aren't bad either!) I love the onesie and that headband is just TOO EASY! I'll have to make that soon! Thanks for sharing! Thanks for stopping by! Thanks!! Haha!